27 year old female with no past medical history presents with vaginal bleeding and abdominal cramping. The patient states that she has been having lower abdominal cramping for the past two days but began having vaginal spotting this morning. She is now passing solid, clot-like material. The patient confirms that she had a positive home pregnancy test two weeks ago but has not followed up with her obstetrician. This is the patient’s first pregnancy. On physical examination, vital signs are blood pressure 90/50, pulse rate 105, respiratory rate 16, temperature 98.1F and pulse oximetry 99% in room air. The patient appears mildly uncomfortable and holding her abdomen. Physical examination is significant for mild lower abdominal distension with diffuse tenderness to palpation with no rebound or guarding. On pelvic examination, there is moderate blood and a closed cervical os. There is no cervical motion tenderness and no adnexal masses are palpated. Labs are quickly drawn and sent, as the patient appears increasingly uncomfortable. The qualitative urine hCG is positive, however, there is a delay for the quantitative serum hCG level. A complete blood count reveals hemoglobin of 10 and hematocrit of 32. You decide to perform a bedside pelvic ultrasound to assess the current status of your patient’s pregnancy. Based on the ultrasound images you obtain, you immediately call your OBGYN colleagues to come evaluate your patient in the emergency department. As you wait for them to arrive, your patient starts to complain of increasing abdominal pain and her repeat blood pressure is 80/50 and pulse rate 120. You immediately order and start transfusing 2 units of packed red blood cells while your patient is taken to the operating room. Ectopic pregnancy is a life threatening diagnosis that results from the implantation of a fertilized ovum outside of the uterus. Most commonly, the fertilized ovum implants in the ampulla of the fallopian tube, but can also be found in the ovaries, cervix, peritoneal cavity or site of prior surgery. Ectopic pregnancy accounts for only 2% of all pregnancies. However, if missed, ectopic pregnancies can quickly grow in size and cause subsequent rupture, massive intraperitoneal hemorrhage and, ultimately, death. Risk factors include prior ectopic pregnancy, history of pelvic inflammatory disease, prior surgery, history of in vitro fertilization, use of intrauterine devices and smoking. The classic triad of abdominal pain, vaginal bleeding and amenorrhea are rarely the presenting symptoms of patients who arrive in the emergency department. More commonly, patients complain of a variety of symptoms that are often difficult to decipher and ultimately hinge on the pelvic ultrasound findings. Before diagnosing an abnormal pregnancy on ultrasound, it is imperative to be familiar with the ultrasound findings for a normal pregnancy. 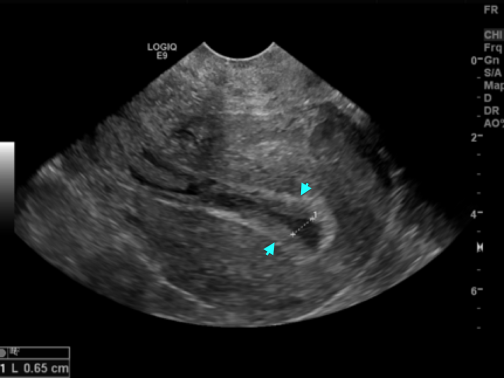 Any patient presenting with vaginal bleeding in the first trimester of pregnancy requires looking for an intrauterine pregnancy on ultrasound. The earliest ultrasound finding of pregnancy is the double decidual sac sign, or gestational sac, which generally appears as an anechoic sac within the endometrium. This may be found as early as four weeks gestation. However, a gestational sac is not a definitive sign of pregnancy and can be indicative of a heterotopic pregnancy. The first definitive sign of pregnancy on ultrasound is a yolk sac within a gestational sac (“sac within a sac”), which has 100% positive predictive value for an intrauterine pregnancy. The yolk sac appears as a hyperechoic ring within the gesational sac. This can typically be seen by five weeks gestation. A fetal pole and cardiac activity can be seen by the 6th to 7th week of pregnancy. It is important to be familiar with the hCG discriminatory zone before deciding on which mode of ultrasound will be most diagnostic of an intrauterine pregnancy. The discriminatory zone is the level of hCG above which an intrauterine pregnancy should be visualized on ultrasound. Most recent literature quotes the threshold for transvaginal ultrasonography as 1,500 to 2,000 mIU/mL. The threshold for transabdominal ultrasonography is 3,000 to 5,000 mIU/mL. If the hCG level is above this threshold, an intrauterine pregnancy should be visualized on either of the above modalities of ultrasound. When performing a bedside ultrasound, it is advised to first begin with a transabdominal ultrasound. It is also important that the patient have a full bladder when performing a transabdominal ultrasound. This will provide an ideal acoustic window in which to view the uterus, adnexa and ovaries. If no intrauterine pregnancy is identified, a transvaginal ultrasound should be performed. This should ideally be done with the patient having an empty bladder, which will aid in visualizing the uterus, adenexa and ovaries. There are a few ultrasound findings specific to identifying an ectopic pregnancy. When no intrauterine pregnancy is identified on ultrasound and there is a measurable hCG level, it is important to be wary of any complex adnexal mass and/or free fluid in the pelvic cul-de-sac. It is also possible to mistake a cervical or corneal ectopic with a normal intrauterine pregnancy. There are other specific findings for an ectopic pregnancy on ultrasound. However, if either of the above findings is identified and no intrauterine pregnancy is present, this is highly suspicious for an ectopic pregnancy. It is also important to be aware that if no adnexal mass or free fluid in the pelvic cul-de-sac is identified, it does not exclude the diagnosis of an ectopic pregnancy. Up to 30% of women with an ectopic pregnancy may have none of the above mentioned ultrasound findings. Transabdominal ultrasound was initially performed to assess for an intrauterine pregnancy. 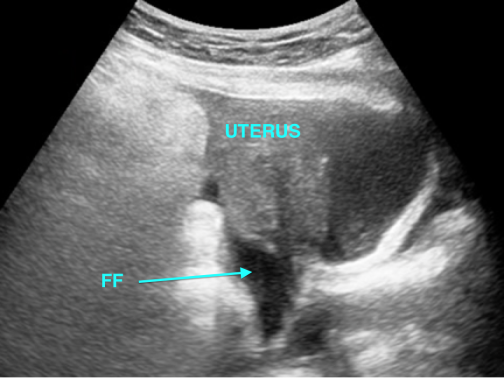 This image shows an empty uterus with no evidence of a gestational or yolk sac. However, this image is important because it does show free fluid within the pelvic cul-de-sac, which should raise suspicion for possible miscarriage versus ruptured ectopic pregnancy versus normal physiologic free fluid. If suspicion for a ruptured ectopic pregnancy is high, it is worthwhile to check to see if there is free fluid in the hepatorenal recess, or Morison’s pouch. The presence of fluid in the hepatorenal recess, no intrauterine pregnancy, and a symptomatic patient in the first trimester of pregnancy is essentially diagnostic for a ruptured ectopic pregnancy. Transvaginal ultrasound was subsequently obtained that shows an empty uterus with no evidence of a gestational or yolk sac. The endometrial stripe (seen between the arrowheads) does appear elongated and thickened which may be consistent with hemorrhage or blood clot. When scanning through both adnexa and ovaries, an adnexal mass was identified by the right ovary. The adenxal mass appeared consistent with a gestational sac with what appears to be a fetus inside. Color flow doppler was applied to the mass which shows another finding consistent with an ectopic pregnancy called the “ring of fire.” This is a finding that occurs with ectopic pregnancy because the developing gestational sac will require increased blood flow. It is crucial to be circumspect of patients that present in their first trimester of pregnancy with abdominal pain, positive quantitative hCG level and a pregnancy of unknown location. This is especially true for patients with a quantitative hCG level that is above the discriminatory zone (1,500 to 2,000 mIU/mL for transvaginal ultrasonography and 3,000 to 5,000 mIU/mL for transabdominal ultrasonography). All of these patients should immediately have an ultrasound performed to look for an intrauterine pregnancy. If none is identified, and/or any of the above signs for ectopic pregnancy are present, an immediate OBGYN consult should be made and the patient adequately resuscitated. When performing a bedside ultrasound for first trimester pregnancy, begin with a transabdominal ultrasound with the patient having a full bladder. If no intrauterine pregnancy is identified, move forward with a transvaginal ultrasound and have the patient empty her bladder. If no intrauterine gestation is identified, a complex adnexal mass and/or free fluid in the pelvic cul-de-sac should make the clinician suspicious for an ectopic pregnancy. However, if neither of the above findings is identified, the diagnosis of ectopic pregnancy is not excluded. The presence of fluid in the hepatorenal recess, no intrauterine pregnancy, and a symptomatic patient in the first trimester of pregnancy is essentially diagnostic for a ruptured ectopic pregnancy. Kuppusamy P, MD. Ectopic Pregnancy. Critical Decisions in Emergency Medicine. Vol 27: 7. 2013 July.